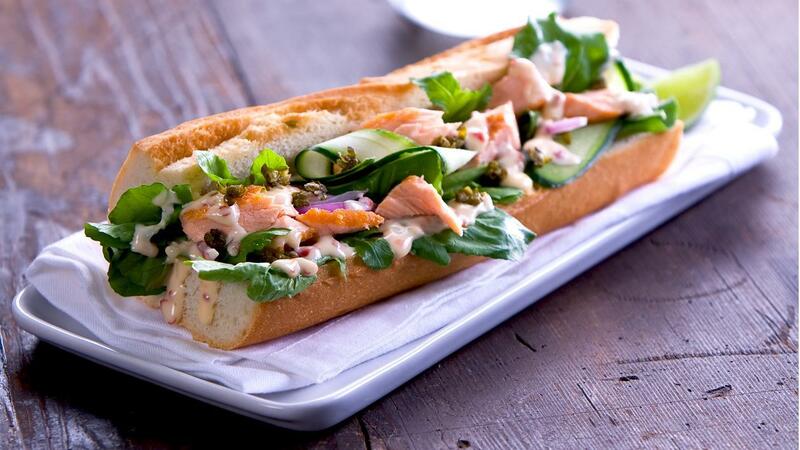 Lime chilli mayonnaise is a simple combination that best suits fresh salmon. Fresh simple flavours that is sure to impress your diners! Rub the salmon with oil, salt and pepper then cook in a pre-heated oven. Once cooled, shred the meat into flakes and store for use. Combine the HELLMANN'S Real Mayonnaise,KNORR Thai Sweet Chilli Sauce GF and lime juice together. To construct your Baguette, slice the baguette in half and place in order the following-rocket, cucumber, salmon and onions and lastly the lime chilli mayo.